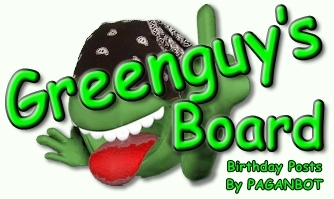 Welcome to the Greenguy's Board. Technical Q & A regarding programming, scripting, servers, etc. Looking for a job? Need to hire someone? This is the only place to spam your products or services. A forum for discussing the marketing of mainstream goods and services. Basically how to make money in non adult stuff. Talk about upcoming shows and discuss past shows. Most users ever online was 9,159, 07-08-2004 at 05:23 AM.